Pamela Kramer, over at Examiner.com, wrote a very nice review and follow up feature on my recent book with author Deborah Blumenthal, The Blue House Dog. The Blue House Dog, written by Deborah Blumenthal and illustrated by Adam Gustavson, is a picture book that will be appreciated by children aged five and older. Adults will enjoy the beautifully created illustrations and the carefully crafted prose that accompanies each picture. The free verse is wisely and elegantly constructed to tell the story with a combination of facts, metaphor and feelings. Just as carefully created are the illustrations. They don't just illustrate the story; they combine seamlessly with the text to create a touching, lovely package. This touching story was inspired by the true story of a stray dog in Astoria, Queens (New York). The dog wandered the neighborhood, named by different people and fed by families, until finally a rescuer captured the dog, treated it for worms, and found it a permanent safe home. The illustrator shared with me some thoughts about the book. 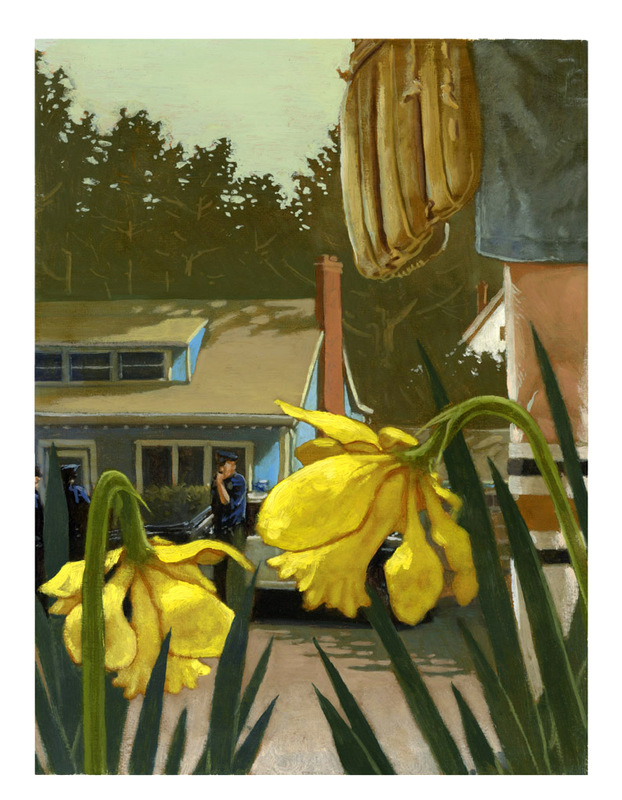 "The Blue House Dog story was so quiet, and Deborah’s choice of language did such a great job of establishing a mood, it seemed even more befitting to zoom out here and there and make an image about the time of day, or to grab images from her text and make them metaphors for some greater theme (the daffodils that bloom, wilt, and return throughout the book, for instance)." He also said, "In the Blue House Dog paintings, I wanted the neighborhood, the elm trees, and the dappled little bits of suburban sunlight to be characters too, and being allowed to take that approach in the pictures can give the the story freedom to sort of float over everything." A wonderful gift for anyone aged five to adult--dog lovers of all ages will enjoy this story of love and friendship and overcoming loss. No bookshelf should be without it. One of the best parts about reviewing books is being able to ask the authors and illustrators questions about their work. Almost without exception, the authors and illustrators are very gracious and happy to explain the creative processes that go into the finished product. An especially beautifully written and illustrated picture book that was recently reviewed was The Blue House Dog. Adam Gustavson, the illustrator, was happy to share his thoughts and actions in creating the beautiful oils that are such an important part of the book. One learns that even childhood experiences can shape illustrations. Adam says, "When I was growing up, my cousin had a big German Shepherd mix. I always liked her markings, particularly around the eyes. I find that when trying to draw a dog, those same German Shepherd-type markings can be the source of so much expressive potential." Adam wanted to make sure he remembered the Shepherd markings and shape so he did research. "When I received the manuscript for the Blue House Dog project, I tracked down a friend with another German Shepherd mix and just followed her around with a camera for an hour or so. Granted, there was no way she was going to do what I would have needed her to do for the book, but I wanted to make sure I at least had accurate reference for the dog’s proportions." It wasn't enough just to get the dog to look right. Adam wanted to try to think like the dog in the story. 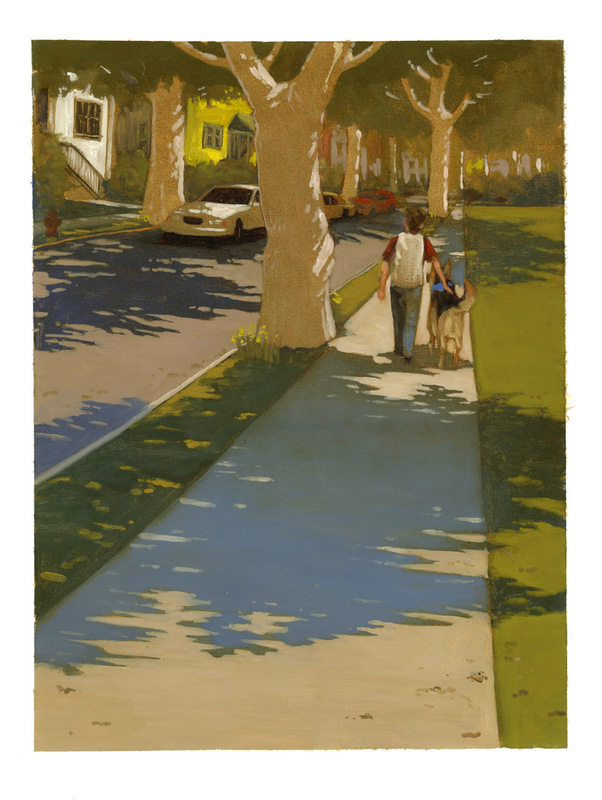 "Beyond that, there was a lot of thinking, though I also spent a bit of time crouching around neighborhoods, trying to see how the world comes together from a dog’s vantage point. (I’m sure this looked splendid to all the neighbors.) 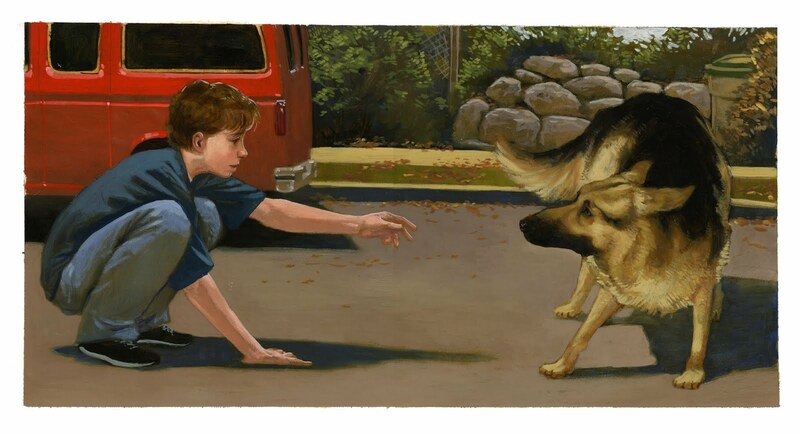 There was a lot of erasing, too, just until I’d fiddled enough with the dog’s body language to get things to feel right, particularly where he’s being skittish or startled." Through Adam's explanations, one can sense the joy he experiences when creating the pictures that illustrate a story. "Arranging the pictures around the text comes pretty early in the process, and I always particularly enjoy that part of picture book illustration. There’s a puzzle to it; somewhere, there’s a vantage point that leaves just the right amount of open space, and sometimes even the off-kilter shape of a paragraph can serve as inspiration. With regard to the subject of each picture—what it shows or doesn’t show—I do sort of feel it’s the job of the illustrations to fill out the story. The pictures get to provide some sort of cinematic backdrop, and to pace out the story by focusing somewhere between the sentences. The Blue House Dog story was so quiet, and Deborah’s choice of language did such a great job of establishing a mood, it seemed even more befitting to zoom out here and there and make an image about the time of day, or to grab images from her text and make them metaphors for some greater theme (the daffodils that bloom, wilt, and return throughout the book, for instance)." Most of all, after talking with Adam, it's quite apparent that illustrating a story is not just creating a group of pictures. Adam thinks about the author's message and how to send that message pictorally as well as in the text. He explained, "It also touched on events that children witness at arm’s length (like the death of the old man). I remember times like that in my childhood; when you’re not close enough to witness something profound first hand, your surroundings can become laden with personal meanings. I remember looking at my neighbor’s house once, after I learned she’d died, and it really looked different. Not in a way that could really be described in words, at least not by me, but that’s something that the subtlety of a picture can be about. There’s a reason Edward Hopper cityscapes have a very particular loneliness to them, and it’s not because anyone’s mugging for the camera, so to speak. It’s something that’s just imbedded in all the formal subtleties of the painting, its color, its compositions, the brushwork even. In the Blue House Dog paintings, I wanted the neighborhood, the elm trees, and the dappled little bits of suburban sunlight to be characters too, and being allowed to take that approach in the pictures can give the the story freedom to sort of float over everything." The Blue House Dog is one of the finest picture books to be released in recent years. It s poetry, metaphor and beauty touch a chord in all who read it--even those who are not animal lovers. Adults as well as younger readers will appreciate the brilliant language and lovely imagery. Thanks, Adam, for shedding some light on your contribution to this fabulous book.